Police Scotland’s new Forth Valley area commander has his sights firmly set on doing away with drug dealers and reducing road deaths. Chief Superintendent John Hawkins (45) officially replaced Chief Superintendent David Flynn as area commander on June 1 this year and has wasted no time in making his priorities clear. Crime in the area fell by 1.3 per cent last year and this is a trend Chief Supt Hawkins is working hard to continue. “What’s important to me and the officers here is to continue to deliver the best local policing we can and that will mean seeking support from colleagues in regional and national units to help us whenever the need should arise. Before taking up his latest post Chief Supt Hawkins, originally from Northern Ireland, was head of operational development at police headquarters in Tulliallan and was involved in restructuring work within the force before it became Police Scotland. A serving police officer for 23 years, he spent the majority of his career in Edinburgh with the old Lothian and Borders Police and was divisional commander for Midlothian and Scottish Borders. He is now working on the local policing plan for Falkirk, which is subject to change as new priorities or threats emerge. The plan currently focuses on six areas: protecting people and places, dealing with antisocial behaviour, violent crime, disrupting organised crime, crimes of dishonesty and making roads safer. From those, Chief Supt Hawkins highlighted two issues that would be getting his officers’ undivided attention over the rest of the year. “The supply of drugs causes real harm in communities. 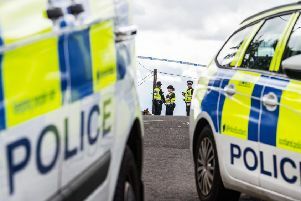 We are well aware of the heath problems they cause, but they are also connected to other crimes of violence, robbery, theft and even organised crime. “So stopping the supply of drugs would reduce and disrupt these other areas of criminality. We can do this with the continued help of local communities across Forth Valley. “It’s really positive to see the level of support we have been getting and we continue to encourage the public to give us information concerning the supply of drugs. Chief Supt Hawkins said 13 people were killed on the roads in the Forth Valley area last year. In fact more people died or were injured on the roads than were murdered or injured as a result of violent crime. “You’re talking 13 deaths, 113 serious injuries and 529 slight injuries, so we appeal to road users in the Forth Valley area to drive responsibly and, in particular, stick to the speed limits. Chief Supt Hawkins said he had enough officers on the ground to effectively police the area but added he could also cope with events like this week’s royal visit. “We have a group of officers in the area doing a great job but we also have access to colleagues in other areas and are able to draw them in to help us.